An epic journey this one, and one that Brian and myself had been saving for a long summer day. 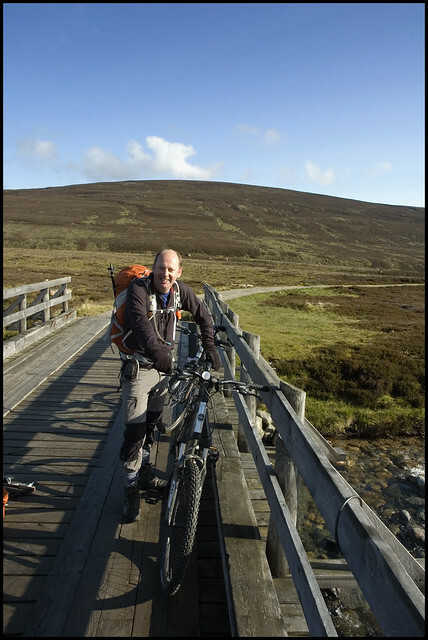 The bikes were hoisted onto the bike rack at 0600 and by 0730 we set off from the Linn of Dee car park. It was a cool 5 degrees centigrade but was warming up quickly. Gloves were required to prevent chilled fingers on the handlebars of the bike. A short 5km stretch, mostly downhill leads to White Bridge. 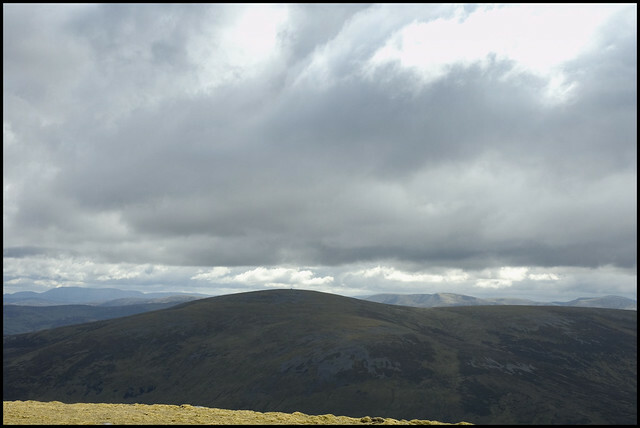 Here we paused for photographs and chatted to a Duke of Edinburgh Silver Expedition group before crossing the River Dee and heading South West, passed the ruins of Ruigh nan Clach and taking the right hand fork to follow the Geldie Burn. Another Duke of Edinburgh group were camped here and we exchanged greetings before heading West to Geldie Lodge. The track which runs alongside the Geldie Burn did not lend itself to a particularly fast approach - it's rough and has 2 or 3 fords to cross. All of the crossings were made with dry feet, but I suspect it would be a very different case if the water levels were much higher. It was on this section of the cycle in that we came across an adder, warming itself in the sun. Upon dismounting to take a closer look, the snake became agitated by our presence - hissing loudly and darting towards us. Keenly aware of the distance between us and the nearest hospital, we took a few snaps from a safe distance. 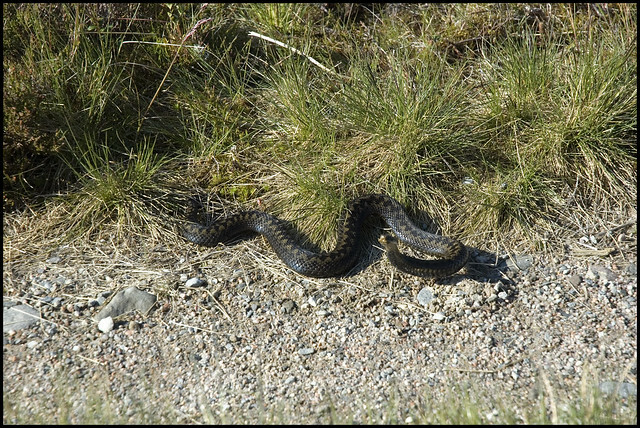 The adder retreated into the heather and we returned to our bikes to cover the remaining distance to Geldie Lodge. 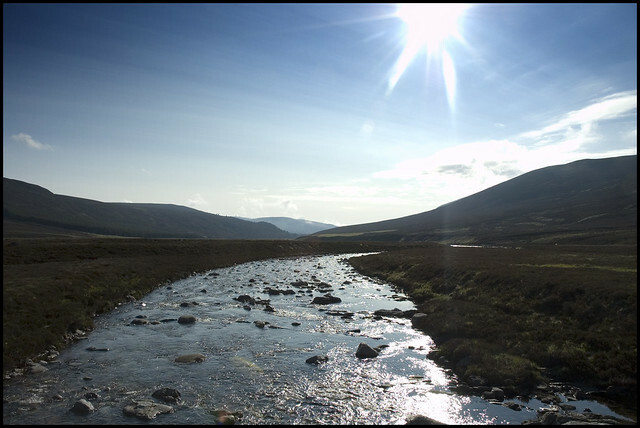 The final obstacle to reaching Geldie Lodge is the crossing of the Geldie Burn. Too deep to cycle through, we managed to use our bikes for balance and again managed to cross without incident. On wetter days, this river crossing might signal the end point of your walk. 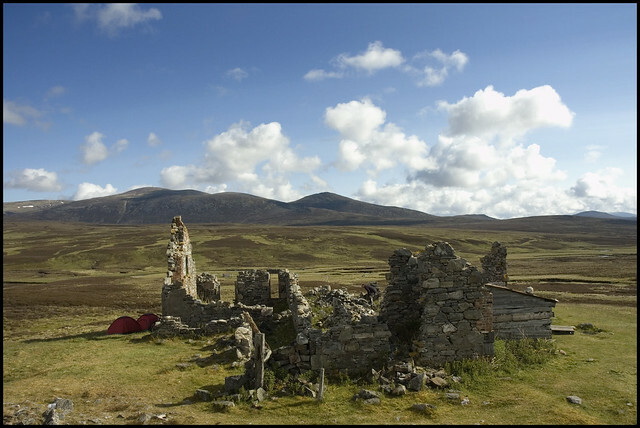 In past times, Geldie Lodge had been a grand Victorian shooting lodge, serving the much larger Marr Lodge near Braemar. Today, it's a ruin - a useful waypoint which provides an excuse to stop, a place to chain up the bikes. By now it was 0900 and we had covered 13km on bike. A 20 minute stop for breakfast and we were off on foot, along an excellent stalker's path which headed South South West towards Carn an Fhidhleir. After around 3km, the path curved around to the North and we went our separate ways - making a beeline across the peat bogs. 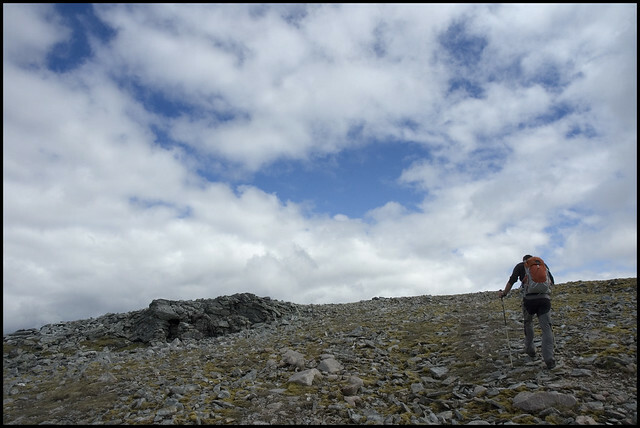 From the depths of the corrie, we took a direct line to the summit of the hill, 400 metres of ascent to arrive on the summit at 1100. Again, widlife provided drama on this section of the walk. Grouse are well known for their ability to explode from their nests at the very last second, removing months, if not years, from your life expectancy. One particular bird decided to wait just a little too long and paid the price when it was skewered through the wing by Brian's walking pole. The bird erupted from it's hiding place in a storm of feathers and bounced across the heather a few times before managing to take flight. 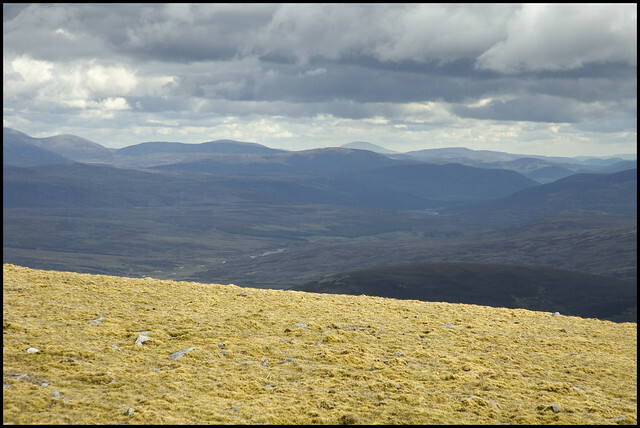 The views from the summit of Carn an Fhidhleir are extensive, with particularly fine views towards the Cairngorms and Beinn a' Ghlo. 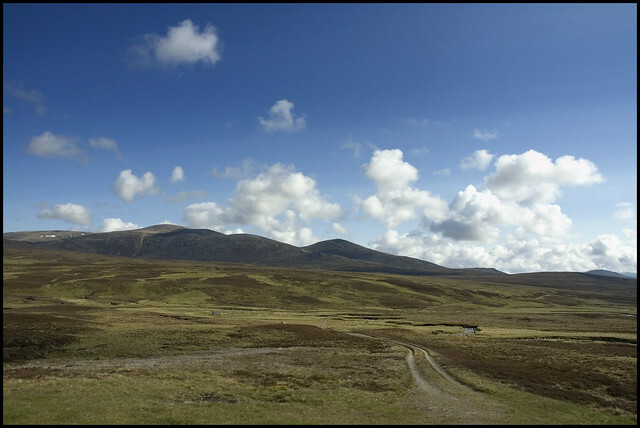 The ever-present Schiehallion also lurked in the distance, as did Lochnagar and possible Buchaille Etive Mor. After a leisurely 25 minutes spend chatting and taking photographs, we set off towards An Sgarsoch. Contouring round the side of the 906m top on a steep grassy slope, I developed a severe bout of two left feet and crashed to the ground. Wrists caught up in walking poles, I was unable to put my hands out and cmae crashing down chest-first onto the largest rock I could find. I had the wind knocked out of me but I managed to escape with only a swollen knee and a slightly bruised chest. 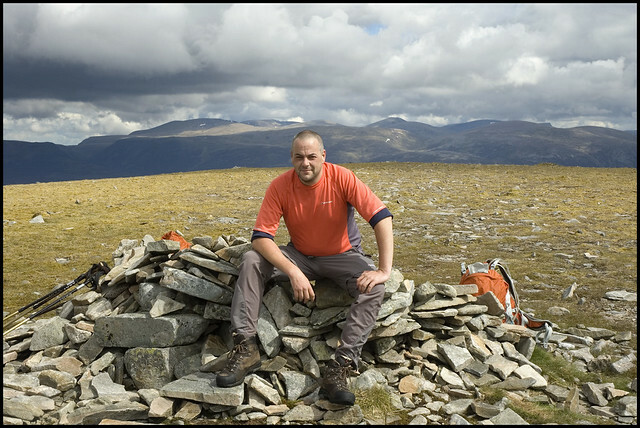 A lucky escape on one of the most remote Munros. 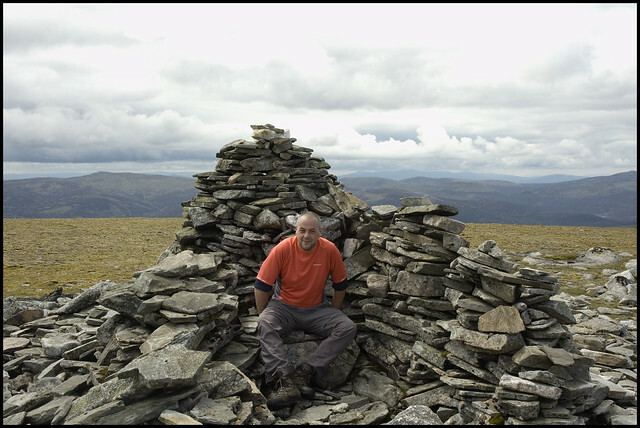 The descent and reascent between the two hills was marred only by the presence of another peat bog but still, we made good time and reached the summit of An Sgarsoch at 1240. Time for lunch! 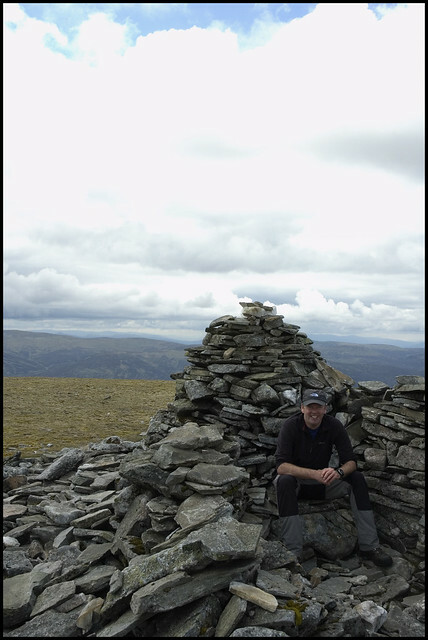 Again, we lingered on the summit, enjoying the sun and the views. 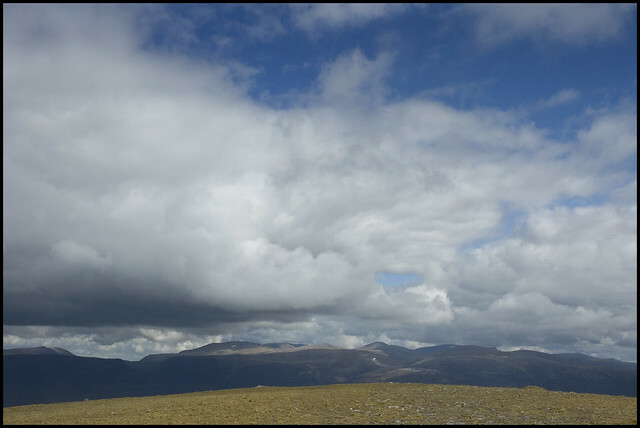 After 30 minutes, we headed North, descending to the bealach between An Sgarsoch and Scarsoch Bheag. From there, a muddy path took us around the western side of the hill to rejoin the stalkers path to take us back to Geldie Lodge. 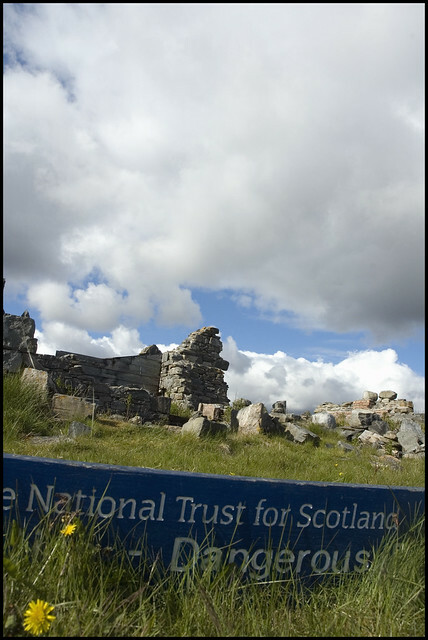 We arrived back at the ruins of Geldie Lodge at 1420 - exactly 5 hours after leaving the lodge - by now we had covered 29km in total - 16 on foot and 13 by bike. The grassy banks beside the lodge provided a grand place to soak up the sun and the views and finish off the coffee. Eventually, we unlocked the bikes at 1440. The 13km cycle in form the Linn of Dee had taken us 90 minutes - the return journey took 50 minutes. We arrived back at the Linn of Dee exactly 8 hours and 42.5km later. Big day out G.Scott. 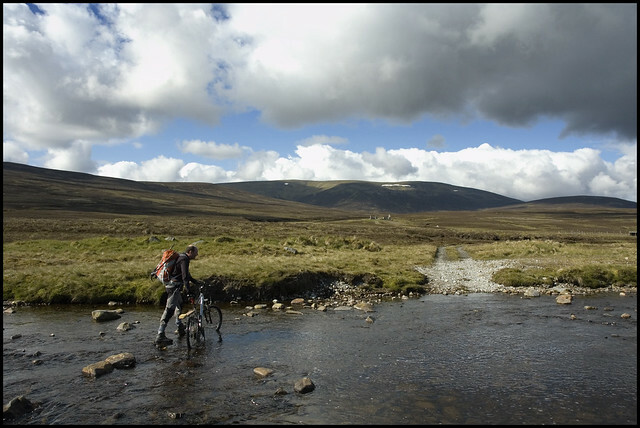 last time I cycled that way I could not cross Geldie burn. It was also blowing a hurricane Good effort and some great photos. 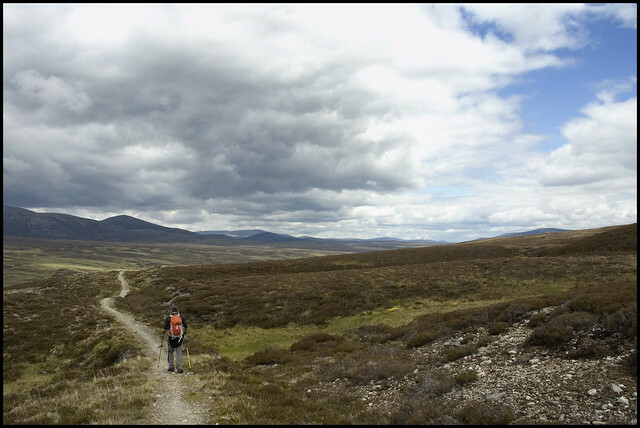 Thanks for sharing your report and pics, I love that part of Scotland - big open spaces. Cheers for that report - one of the best I've seen of these two from the Braemar side . Excellent & useful report - hope to do exactly the same as soon as we get a dry spell followed by a good weekend (so maybe not any time soon ). 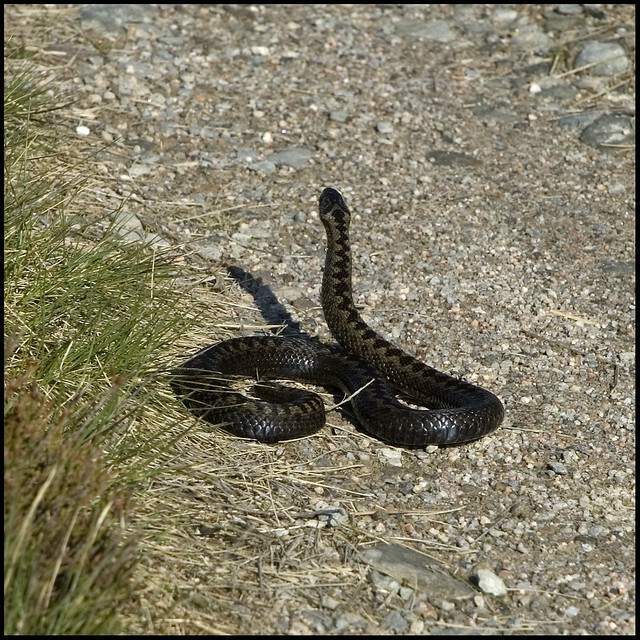 And yet another report from this area to feature adders. Only ever seen grass snakes in the UK so all the more reason to wait for some sunshine. Very informative report. I'm doing the same journey next week by myself and using the bike. Rainfall has been a plenty so it's good to know what I could be up against regarding the river crossings.